Rami Anis, Yiech Pur Biel, James Nyang Chiengjiek, , Yonas Kinde, Anjelina Nada Lohalith , Rose Nathike Lokonyen, Paulo Amotun Lokoro Yolande Bukasa Mabika Yusra Mardini, Popole Misenga. The above are ten people you have probably never heard of, but all of them are flying the flag for the sixty million refugees world wide. 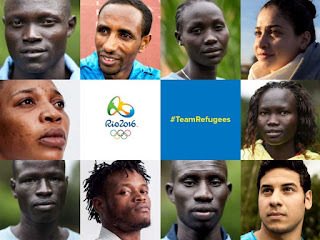 All of the above make up the Olympic refugee team in Rio 2016. I applaud the International Olympic Committee for making $2,000,000 available to provide training facilities, support and equipment for these 10 talented people. All had the courage grit and dedication to qualify for this years Olympics. "This will be a symbol of hope for all the refugees in our world, and will make the world better aware of the magnitude of this crisis. It is also a signal to the international community that refugees are our fellow human beings and are an enrichment to society." 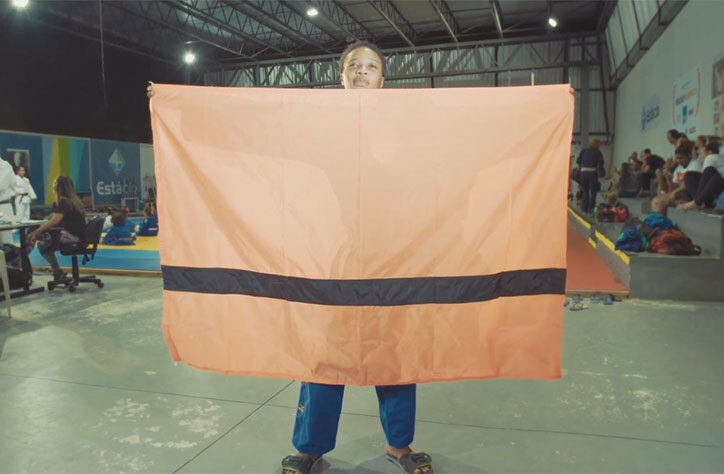 The team also now has its own Olympic Flag, they are not allowed to wear in in the arenas but they are being distributed all over Rio to raise awareness of the refugee crisis. On Thursday morning we have to drive down south to see the out-laws, just for two nights - a round trip of some 640 miles. Now I don't mind visiting the aged relatives, but I have been given my orders. I have already decided to cut the lawns before we go - to save coming back to a jungle, but my orders seem to me to be a little OTT. I must clean the house from top to bottom and change the sheets before we go! can someone please explain to me why, if we spend a night or two away from home the whole cleaning rigmarole has to be adhered to. I am told that it's nice to come home to a clean house - but surely the same applies if we go out for the day - there is a twisted logic here! Is this just the whim of "she who must be obeyed" or is this "normal" practice? Having got that off my chest I have to admit that after two weeks of house husbanding things are getting a bit on top of me - the kitchen in particular is a bit untidy. I am thinking Tesco's own brand paper towels to save money - or maybe Thirst Pockets which I am told are very good, they should solve my kitchen problem shown below. 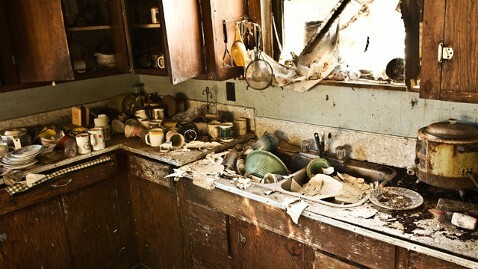 There is no twisted logic here..go get your marigolds on Neil! Haha!!! ���� you're going need more than marigolds for that. Gosh, no wonder Ellen has to go and do a round or two of crochet! I'd walk away from that too!